For more than 90 years, Schlage has been creating the strongest and most technologically advanced security products for homes, multi-family, commercial, and institutional buildings. Schlage pioneered and created the first smart home device more than 100 years back when Walter Schlage patented a door lock that also turned the home’s lights on and off. From durable mechanical locks to comprehensive electronic access control solutions and biometrics, Schlage provides protection at critical moments – when property and personal security are at stake. In homes, public buildings, and the workplace, at the end of the day, Schlage stands for one thing: strong. The Schlage L Series has long been the benchmark for mortise locks. The L Series is more than strength and security – it offers tremendous flexibility to allow it to meet the needs of almost every application. 180 degree visibility indicators, advanced motor-driven electrified functions, a universal lock case that supports 10 different functions, and the ability to suite across tubular, exit device, and multipoint locks allow the Schlage L-series mortise to integrate seamlessly into any environment. Schlage Locks and Deadbolts undergo Cycle Test, Resistance Test, Door Impact Test, Warped Door Test and Bolt Strength Test to determine their ANSI grade level. Exceeds ANSI/BHMA Grade 1 standards. 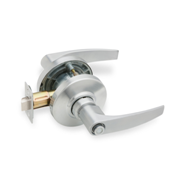 Deadbolt functions include anti-saw pin in bolt to prevent cut-through. Security blocking hub prevents lock picking by removing levers. 31 lever, five rose and two escutcheon designs. Locking lever bushing eliminates exposed screws on inside levers. All levers suite with Von Duprin exit devices. Meets BAA (Buy American Act). UL listed for 3-hour fire door (except L9076 and L9007). 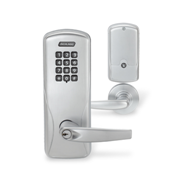 Buy L Series Schlage Commercial Locks here. View / Download L Series Schlage Mortise Lock Documentation files. The ND Series heavy-duty cylindrical lock is able to handle any application and is one of Schlage’s best-selling mechanical locks. ND Series locks have been the most popular Schlage product ever since Walter Schlage invented the cylindrical lock in 1920. The lock can withstand 3,100 in-lb. of abusive lever torque, as well as 1,600 lbs. of offset lever pull for protection against pry bar attacks. The lock is not only strong from attacks, but it also shows nearly zero droop or wobble after 16 million cycles. The ND Series is ANSI/BHMA Grade 1 certified and performs beyond Grade 1 standards. ND Electrified lock works with access control system to provide advanced security in high traffic areas. Uses a motor instead of a solenoid, thus offering unparalleled energy efficiency and flexibility in wired electrified applications. More ECO - A maximum current draw of 0.23 amps not only saves energy, but allows more locks to run on a single power supply. Automatically operates from 12 to 24VDC, and the operating mode (electrically locked or unlocked) can be changed by simply toggling a switch on the chassis. Vandlgard trim is specifically designed for highly abusive environments. The outside lever rotates freely up and down when locked, preventing damage to internal lock components caused by excessive force from kicking, hitting or standing on the lever to gain access. Buy Schlage ND Series Mechanical Cylindrical Locks. 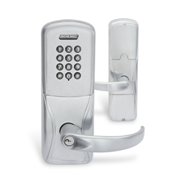 Buy Schlage ND Series Electrified Cylindrical Locks. 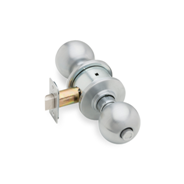 Schlage D Series cylindrical locks are knob-only locks built to survive in the toughest environments. The D Series provides heavy-duty performance for high-traffic applications. The ANSI/BHMA Grade 1 rating allows the D Series to fit in applications like military barracks, back-of-house hospitality and repair/replace instances. 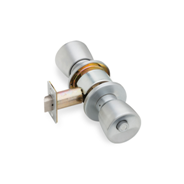 Schlage D Series locks are available for remote electrical locking and unlocking for high security and fire safety applications. Browse / Buy D Series Schlage Cylindrical Locks. 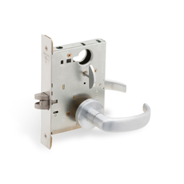 The AL Series cylindrical locks are for high-traffic interior and exterior applications. The AL Series is designed to offer reliable security in medium- to high-traffic areas. It is designed for interior office doors, banks, retail spaces, hotel guest areas and many other applications. 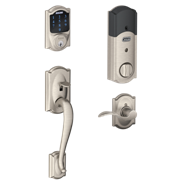 Buy Schlage AL Series Cylindrical Locks. The A Series cylindrical lock is Schlage's first lock and continues to exceed ANSI/BHMA Grade 2 standards, allowing it to be used in a wide range of medium-traffic commercial and heavy-duty residential applications. Buy Schlage A Series Cylindrical Locks. 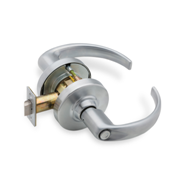 Schlage AD Series locks are designed from ground up to be completely flexible, adaptable and scalable. The AD Series is a perfect fit today and can be upgraded to meet evolving needs in the future. 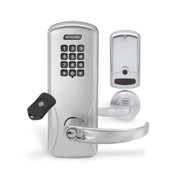 There are a variety of options that allow you to select the AD Series electronic lock that’s right for you, and a wide selection of features that can be configured in the field to further customize each opening. The innovative, modular design of the AD Series provides the same level of security you’ve always expected from Schlage, plus the confidence of knowing your investment is every bit as secure as your facility. When your needs change in the future, the AD Series allows you to easily upgrade the credential reader or networking option, and adapt to emerging technologies using your existing chassis – all without taking the lock off the door. They easily integrate into popular electronic access control systems from Software Alliance members to deliver a comprehensive EAC solution. Offline lock can be manually programmed using keypad for basic use or managed with PC based Schlage Express Software. Buy AD200 Schlage Door Locks here. Buy AD201 Schlage Door Locks here. Easily upgradable to a networked wireless lock if requirements change in the future. Offers a wide range of credential options including PIN, magnetic stripe, proximity (125Khz) and Smart (13.56MHz) credentials. 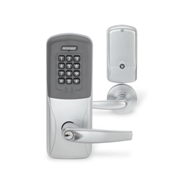 Buy Schlage AD300 Electronic Locks here. 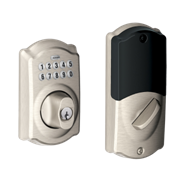 Buy Schlage AD301 Electronic Locks here. 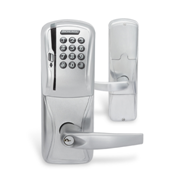 Buy Schlage AD400 Electronic Locks here. 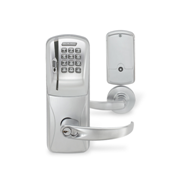 Buy Schlage AD401 Electronic Locks here. Schlage CO Series is an ideal solution for customers seeking the added security and convenience of electronic access control without the cost or complexity of a fully networked system. The CO Series has been tested to the highest standards in the industry to ensure the quality and reliability you have come to expect from Schlage. Buy CO100 Schlage Keypad Locks here. 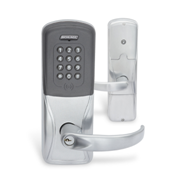 Buy Schlage CO200 Standalone Electronic Lock here. Buy Schlage CO220 Classroom Lockdown Lock here. 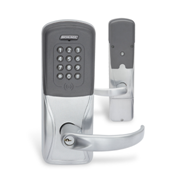 Buy Schlage CO250 Standalone Lock here. View / Download Schlage CO Series Documentation files. Schlage Sense Smart Deadbolt makes controlling access to your home simple and safe. Enter an access code on the touchscreen to unlock the door instead of searching your pockets for keys. Buy Schlage Keyless Deadbolt here. 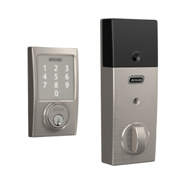 Schlage Connect Touchscreen Deadbolt allows the user to manage door security from anywhere when paired with a compatible home automation or security system. Remote notification to know when someone goes in or out. Buy Schlage Connect Touchscreen Deadbolt here. Schlage Connected Keypad is an easy to install keypad which makes coming and going keyless, effortless and painless.